The hereditary contribution to ovarian cancer has been increasingly recognized over the past decade, with a 2014 Society of Gynecologic Oncology (SGO) recommendation for all women with epithelial ovarian cancer to be considered for genetic testing. The objective of the study was to determine if disparities exist in genetic referrals and characterize referral patterns over time. 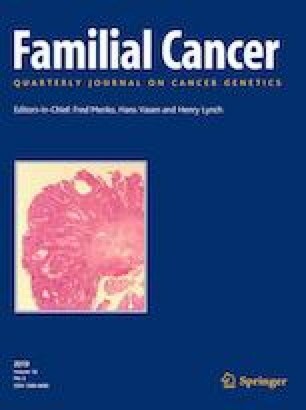 A retrospective cohort study included all women diagnosed with invasive epithelial ovarian cancer at the University of Virginia from 2004 to 2015. Clinicopathologic data were abstracted from the electronic medical record and analyzed for association with genetic referral and testing. We identified 696 cases, with a median age of 62 years and a median follow up of 25.2 months (range 1–115). Thirty-four percent were referred for genetic counseling with an 80% genetic testing rate in those women. Referrals increased from a rate of 8% in 2004 to 68% in 2015. On multivariable analysis, papillary serous histology (OR 1.6, 95% CI 1.0–2.6), stage III disease (OR 3.4, 95% CI 1.6–7.5), ovarian cancer family history (OR 2.6, 95% CI 1.5–4.6), breast cancer family history (OR 1.7, 95% CI 1.1–2.5), and diagnosis after 2014 (OR 2.3, 95% CI 1.3–4.1) remained significantly associated with genetics referral. Older age and living > 100 miles away were associated with decreased referral (OR 0.97, 95% CI 0.95–0.99 per year and OR 0.49, 95% CI 0.28–0.86). As only 68% of women with epithelial ovarian cancer were referred in 2015 innovative strategies such as Medicare coverage for counseling are still needed to universalize testing. Preliminary findings were presented at the 2017 Mid-Atlantic Gynecologic Oncology Society Annual Meeting in Charleston, South Carolina. Funding for this study was provided by the Obstetrics and Gynecology Department at the University of Virginia.